The challenging future of national and regional newspapers is now the staple diet of media commentators. If you have been reading the press writing about the press you’d all be forgiven for questioning your choice of career. I’m not denying we’re in a tough place – we are. But I don’t want to use this speech to make grand statements on the future of our industry. I want to talk to you about journalism. This entry was posted in Events, Journalism, Newspapers and tagged advertising revenue, Afghanistan, associated newspapers, Barak Obama, BBC, Becky, camp Bastian, car crash, case law, Charles, Daily Star, deputy editor, digital cameras, distinguished chair, Ed Balls, Eddie Shah, editor, executive, Family Liaison officer, farmer, GBP, Geoff Hurst, George Pascoe, George Pascoe Watson, Germany, Helmut Haller, Help, High Court, Hugh Cudlipp, Inexplicably Mike, Iraq, ITN, ITV, journalist, kabul, Major, Matt Drudge, Max Mosley, media commentariat, media commentators, media outlet, Mike Payne, Moon pub, Munchausen syndrome, News International, News of the World, newspaper advertising revenues, newspaper editor, pence, Perez Hilton, political editor, Portsmouth, Press Complaints Commission, Prime Minister, Prince, privacy law, Professor, Rebekah Wade, Rome, Roy Whiting, Royal Military, Sara Payne, Sarah Payne, Secretary, Sergeant, short haul travel, Sky News, Spain, Sundance, Sunday Times, Sunny Blackpool, Taliban, Terry Leahy, Tesco, The Daily Mail, the Daily Star, The Guardian, The Mirror, the News of the World, the Press Complaints Commission, The Prime Minister, The Sun, The Sun. Sky News, the Sunday Times, the Telegraph, The Telegraph Group, The Times, the World Cup, Twogood, United Kingdom, Victor Burnett, Wayne Rooney, world cup, Yasser Arafat on January 27, 2009 by Judith Townend. Prince Harry is to be withdrawn from his tour of duty in Afghanistan after reports on US blog, Drudge Report, revealed he was serving with British forces there. The Ministry of Defence (MoD) issued a statement today confirming speculation that the third-in-line to the throne would cease active service and return to the UK. “Following a detailed assessment of the risks by the operational chain of command, the decision has been taken by Air Chief Marshal Sir Jock Stirrup, Chief of Defence Staff, in consultation with General Sir Richard Dannatt, Chief of the General Staff, to withdraw Prince Harry from Afghanistan immediately,” read the statement. 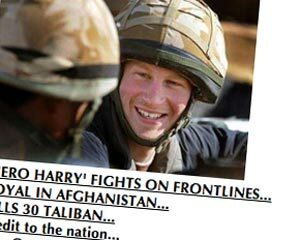 The media blackout agreed between the Ministry of Defence and UK news outlets about Prince Harry’s secret deployment was broken after popular US blog, The Drudge Report, ran a story about his activities in Afghanistan. The MoD and the media struck a deal that meant extended access to Prince Harry during his time in Helmand Province in exchange for news of his deployment to be held until after his tour had been completed. A stipulation of the agreement was that media in the UK would hold its stories unless a foreign news publisher made the news public first. When Drudge broke the story news groups in the UK were then forced to flood their stories on an unsuspecting public. The MoD asked the media to refrain from speculating on Prince Harry location and other details of his mission until he returns to the UK. This entry was posted in Journalism, Online Journalism and tagged Afghanistan, Air Chief Marshal, blogs, Chief, Chief of the General Staff, Drudge report, foreign news publisher, General, Harry, Helmand Province, Jock Stirrup, media blackout, media coverage, Ministry of Defence, Prince, Richard Dannatt, United Kingdom, United States on February 29, 2008 by Oliver Luft.